Ah, Friday — the gateway to two whole days of freedom. Bliss. Before the babe, my weekend adventures would begin as soon as the workday ended. I’d go to a fun wine bar downtown with friends, to parties in artsy Brooklyn lofts, or to a neighborhood restaurant for a cozy dinner. Other times I’d travel. Occasionally I’d spend the better part of the weekend lounging on the couch watching Top Chef or Million Dollar Listing marathons. Now that the babe is here, weekends are chaotic, unpredictable but more special than ever before. They’re all about Mason, at least until he goes to bed and then we enjoy a few hours to ourselves. Tonight after Mason went to bed, I felt like playing with a some fruit. Pears and peaches are two of my favorites, and I want Mason to love them too. He’s already a huge fan of pears, but he hasn’t tried peaches yet. It’s not the season for peaches but frozen organic peaches are still rich in vitamin C so I picked up a bag last time I was at the store. It’s not pear season either but the market still has decent-looking organic pears (albiet crisp pears), so I picked up a few after work. I cooked the fruits separately, blended each one into a very smooth puree, and then mixed them together with a spoon. 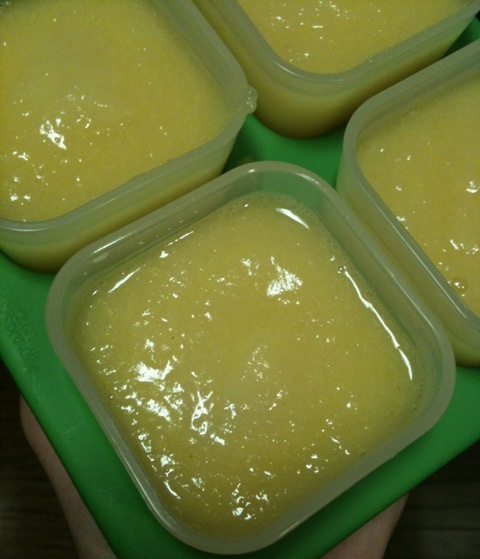 The fruit was so tender after cooking that I needed very little water to get the right applesauce-like consistency. Combined, the flavors were very mellow and balanced but sweet enough to add a little pizazz to baby oatmeal or plain yogurt. Here’s to hoping Mason is as pleased with the blend as I am! 1. Peel the peach, if fresh. Steam until tender, around 15 minutes. 2. Peel the pear. Steam until tender, around 15 minutes. 3. Puree together or separately, using cooking liquid to reach your desired texture (think smooth, like applesauce). *I’m a working mama so I always prepare extras to freeze. 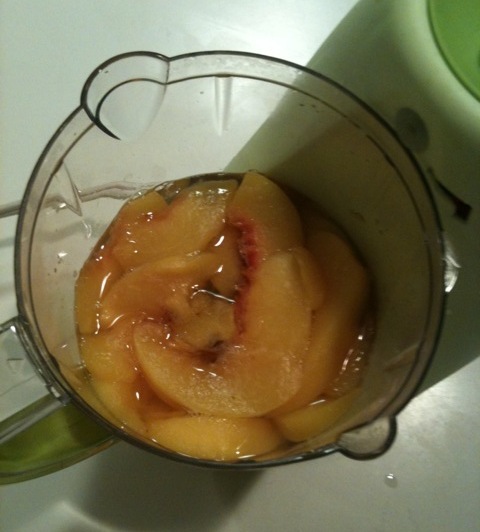 The three pears and three peaches that I cooked with tonight yielded 16 ounces of fruit puree. What other yummy peach combos does your baby love?